Comments: Since 1979, Charles Ka`upu has taught, performed and danced. He travels extensively with the well known group HAPA..An accomplished master of chant, this long awaited CD comes with a 16 page booklet with complete Hawaiian Lyrics and English translations inside. 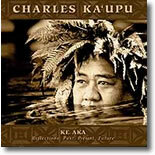 July 13,2011- Charles Ka`upu passed away suddenly today. He is now in the arms of Ke Akua. He will be missed by all of us who loved him, loved his chanting, his lei po`o, his contribution to the Hawaiian people, as well as the visitors worldwide who enjoyed him at the Old Lahaina Lu`au show. He was an amazing, unforgettable Hawaiian man.